he latest reports indicate that both LTTE aircraft entered into the Colombo aerospace were destroyed by the air defence system. One of the aircraft disabled by anti air gunfire reportedly crashed in the rear of the Inland Revenue Department building located on the Sir C.A. Gardiner road. the Two LTTE aircraft were detected in the air above the Colombo around 9.45 last night (Feb 20). Following the detection, air defence system was activated causing the two terrorist aircraft to abort their missions. Air Force sources said that the second aircraft that had be [Click to magnify/shrink] en trying to escape from air defence system was shot down while flying over Negambo . Parts of the destroyed aircraft along with the body of the pilot were found close to the Katunayake Air Base. Due to the crash of the terrorist aircraft in Colombo 47 people have suffered injuries. According to the sources at the National Hospital Colombo, two of the injured were succumbed to their injuries. Meanwhile, another 6 civilians suffered injuries in the air craft crash in Katunayake were admitted to the Negambo hospital. One of the injured has been transferred to the national hospital , Colombo, hospital sources said. 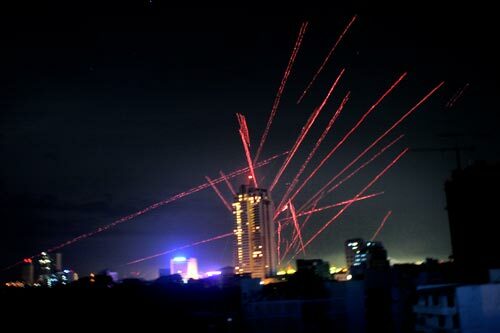 The night sky was set aglow when security forces fired shots and flares into the air.